The Joint Committee on Taxation (JCT) released an official dynamic estimate of the Tax Cuts and Jobs Act (TCJA) yesterday as reported by the Senate Finance Committee showing that the bill would still add over $1 trillion to the debt when economic effects are included. The economy would be an average of 0.8 percent larger over the decade, resulting in a less than a 0.08 percentage point increase in the average annual economic growth rate. 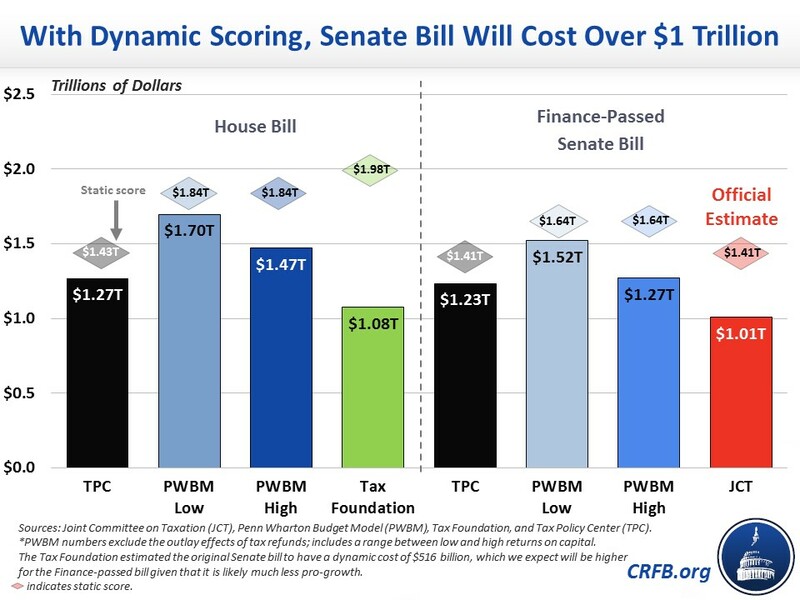 Today, the Tax Policy Center (TPC) released its own dynamic estimate showing that the bill would still increase the debt by at least $1.2 trillion, confirming JCT and every other estimator's findings that the tax bills will not pay for themselves. 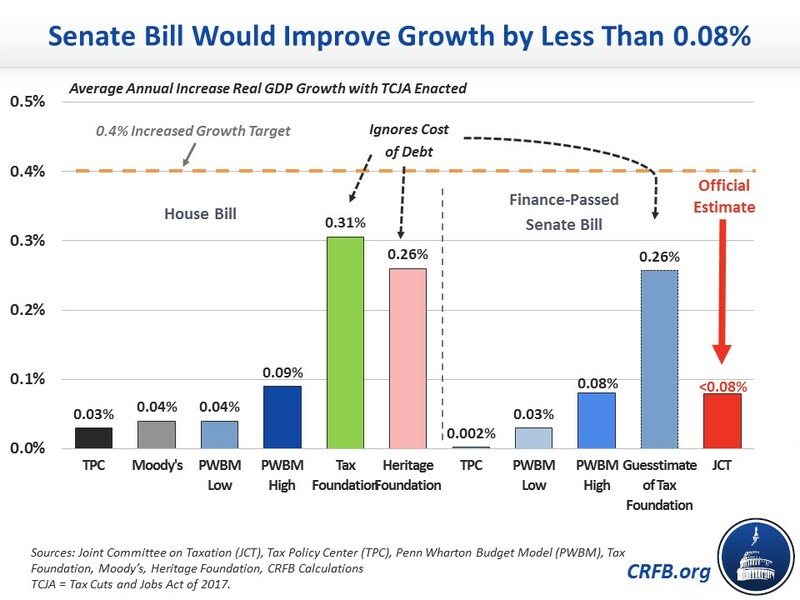 TPC estimates that the Finance-approved bill would increase the size of the economy in 2027 by just 0.02 percent, resulting in about a 0.002 percentage point increase in the average annual growth rate. This compares to JCT's official estimate of a less than 0.08 percentage point increase and falls well short of the 0.4 percentage point increase that lawmakers are targeting. TPC projects that the economy would be 0.5 percent larger in 2025 than under current law, translating to a 0.06 percentage point increase in the annual growth rate. However, that would fall to almost nothing once the individual income tax cuts expire, and certain corporate tax hikes go into effect in 2026 and 2027. In terms of the bill's cost, TPC's economic estimate would lower the cost of the bill from $1.4 trillion over a decade for the conventional cost to $1.2 trillion. This compares to JCT's official estimate that the bill would still add over $1 trillion to the debt by 2027 including economic effects. With this latest estimate, we can all but confirm JCT's official finding: these tax bills will not pay for themselves. Lawmakers should works towards making improvements to the Senate bill so that it doesn't add to the debt; they can start by examining these five ways to do so.